Not to be confused with Anderson, Texas. 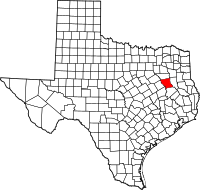 Anderson County is a county in the U.S. state of Texas. As of the 2010 United States Census, the population was 58,458. Its county seat is Palestine. Anderson County was organized in 1846, and was named for Kenneth L. Anderson, who had been the final Vice President of the Republic of Texas (died 1845). Anderson County comprises the Palestine, TX Micropolitan Statistical Area. The county is wholly located within area codes 430 and 903. Indians friendly to the settlers resided in East Texas before the Kiowa, Kickapoo, Kichai, Apache, and Comanche intruded upon their territory. These tribes hunted, farmed the land, and were adept traders. By 1772, they had settled on the Brazos at Waco and on the Trinity upstream from present Palestine. The Tawakoni branch of Wichita Indians originated north of Texas, but migrated south into East Texas. From 1843 onward, the Tawakoni were part of treaties made by both the Republic of Texas and the United States. On May 19, 1836, an alliance of Comanche, Kiowa, Caddo, and Wichita attacked Fort Parker, killing or kidnapping all but about 18 settlers, who managed to escape to Fort Houston, which had been erected in Anderson County in 1835 as protection against Indians. Among the captured was Cynthia Ann Parker, who later became the mother of Quanah Parker, a Comanche chief. Some residents of Anderson County are related to Cynthia Ann Parker. In October 1838, Gen. Thomas Jefferson Rusk conducted a raid against hostile Indians at Kickapoo, near Frankston, ending the engagements with the Indians in East Texas for that year. In 1826, empresario David G. Burnet received a grant from the Coahuila y Tejas legislature to settle 300 families in what is now Anderson County. Most of the settlers came from the southern states and Missouri. Baptist leader Daniel Parker and eight other men organized the Pilgrim Predestinarian Regular Baptist Church in Lamotte, Illinois. This entire group migrated in 1833 to the new frontier of Texas. Among this group were Silas M. Parker, Moses Herrin, Elisha Anglin, Luther T. M. Plummer, David Faulkenberry, Joshua Hadley, and Samuel Frost. Fort Parker was the earliest actual settlement in the vicinity. After the fort was attacked, some of the survivors moved to Anderson County. The First Legislature of the State of Texas formed Anderson County from Houston County on March 24, 1846. The county was named for Kenneth Lewis Anderson. Palestine was named the county seat. Anderson County voted for secession from the Union. When the Civil War began, former Palestine district judge Judge John H. Reagan served in the cabinet of the Confederate government as postmaster general, being captured at the end of the war and spending 22 months in solitary confinement. During Reconstruction, District Nine Court Judge Reuben A. Reeves, a resident of Palestine, was removed from office as "an obstruction to Reconstruction" in part because of his refusal to allow blacks to participate as jurors in the judicial process. In 1875, the International – Great Northern Railroad placed its machine and repair shops and general offices in Palestine, causing the community to double in size over the next 5 years. For a time, it was a rough railroad town, dominated by male workers. White violence against blacks occurred in the county. In July 1910, at least 22 blacks were killed in white rioting near Slocum, a majority-black community, in what is called the Slocum Massacre. Racial and economic tensions were high and southern states had disenfranchised blacks and imposed Jim Crow in furtherance of white supremacy. Anderson County tied for 13th place in a list of the 25 American counties with the highest number of lynchings between 1877-1950 (all were located in the South). Oral tradition in the African-American community says that as many as 200 blacks may have been killed in the massacre. An estimated 200 whites rioted and attacked blacks on the roads, in the fields, and in Slocum on July 29–30, 1910. Many black homes were burned, and black families fled for their lives, having to abandon their property and assets. This town is about 20 miles east of the county seat at Palestine. At the time, as was usual, events were described as a "race riot" by blacks; Texas newspapers mistakenly had contributed to problems by reporting rumors that 200 blacks were arming. Afterward, 11 men were arrested and seven were indicted, including James Spurger, said by many to be the instigator, but no prosecution resulted. The massacre had been preceded by racial tensions, rumors, and, for 6 months, at least one lynching per month of blacks in East Texas. In January 2016, the state installed a highway historical marker in Slocum to recognize this unprovoked attack on the black community. In January 1928, the first oil-producing well in Anderson County, the Humble-Lizzie Smith No. 1, was completed. From 1929 to 2000, 295,904,540 barrels (47,045,062 m3) of oil were produced from county lands. The Fairway Oil Field was discovered in 1960, and straddles the border of Anderson and Henderson Counties. Oil is produced from the Lower Cretaceous James Limestone member of the Pearsall formation. The Gus Engeling Wildlife Management Area was purchased by the state between 1950 and 1960, much of it formerly owned by Milze L. Derden. The area was renamed in 1952 for Gus A. Engeling. The first state biologist assigned to the area, he was killed by a poacher on December 13, 1951. The terrain of Anderson County consists of hills carved by drainages and gullies, with numerous lakes and ponds. The Trinity River flows southward along the west boundary line of the county; the Neches River flows southward along its east boundary line, and Brushy Creek flows southeastward through the central portion of the county. The terrain slopes to the south and east, with its highest points along the midpoint of its northern boundary line at 551' (168m) ASL. The county has a total area of 1,078 square miles (2,790 km2), of which 1,063 square miles (2,750 km2) are land and 15 square miles (39 km2) (1.4%) are covered by water. As of the 2000 United States Census, 55,109 people, 15,678 households, and 11,335 families were in the county. The population density was 52 people per square mile (20/km²). The 18,436 housing units averaged 17 per square mile (7/km²). The racial makeup of the county was 66.44% White, 23.48% African American, 0.64% Native American, 0.45% Asian, 0.03% Pacific Islander, 8.00% from other races, and 0.96% from two or more races. About 12.17% of the population was Hispanic or Latino of any race. Of the 15,678 households, 34.10% had children under the age of 18 living with them, 55.50% were married couples living together, 13.20% had a female householder with no husband present, and 27.70% were not families. About 24.80% of all households were made up of individuals, and 11.80% had someone living alone who was 65 years of age or older. The average household size was 2.58, and the average family size was 3.07. The county population contained 20.70% under the age of 18, 9.30% from 18 to 24, 37.70% from 25 to 44, 20.60% from 45 to 64, and 11.70% who were 65 years of age or older. The median age was 36 years. For every 100 females, there were 155.80 males. For every 100 females age 18 and over, there were 173.40 males. The median income for a household in the county was $31,957, and for a family was $37,513. Males had a median income of $27,070 versus $21,577 for females. The per capita income for the county was $13,838. About 12.70% of families and 16.50% of the population were below the poverty line, including 21.60% of those under age 18 and 16.60% of those age 65 or over. Anderson County is governed by a commissioners court. It consists of the county judge, who is elected at-large and presides over the full court, and four commissioners, who are elected from the county's four single-member precincts. The Texas Department of Criminal Justice operates state prisons for men in the county. The prisons Beto, Coffield, Michael, and Powledge units and the Gurney Unit transfer facility are located in an unincorporated area 7 miles (11 km) west of Palestine. The Beto Unit has the Correctional Institutions Division Region II maintenance headquarters. Jeff Doran, a Republican, is the judge of the county court at law. Anderson is a strongly Republican county, voting Republican in every election since 1980 (as of 2016). The county last voted Democratic in 1976, when Jimmy Carter won 57% of the county's votes. Hillary Clinton managed to win just 19.8% of the vote in the county, the least of any presidential candidate since at least 1960. Anderson County is part of the Dallas/Fort Worth DMA. Local TV media outlets include: KDFW-TV, KXAS-TV, WFAA-TV, KTVT-TV, KERA-TV, KTXA-TV, KDFI-TV, KDAF-TV, and KFWD-TV. Other nearby TV stations that provide coverage for Anderson County come from the Tyler/Longview/Jacksonville market and they include: KLTV, KTRE-TV, KYTX-TV, KFXK-TV, KCEB-TV, and KETK-TV. Newspapers serving Anderson County include the Palestine Herald-Press in Palestine and the weekly Frankston Citizen in Frankston. E.R. Bills wrote The 1910 Slocum Massacre: An Act of Genocide in East Texas (2014) about white mobs rioting and killing at least 22 blacks in Anderson County in July 1910, and driving off hundreds more. ^ "Population and Housing Unit Estimates". United States Census Bureau. Retrieved February 12, 2019. ^ a b "State & County QuickFacts". US Census Bureau. Retrieved December 8, 2013. ^ Texas Area Codes - Cities & Prefixes - Area Code 430, Public Utility Commission of Texas website, retrieved July 30, 2015. ^ Texas Area Codes - Cities & Prefixes - Area Code 903, Public Utility Commission of Texas website, retrieved July 30, 2015. ^ "Fort Houston, Texas". Texas Escapes - Blueprints For Travel, LLC. Retrieved May 2, 2010. Texas Escapes - Blueprints For Travel, LLC. ^ "Frankston, Texas". Texas Escapes - Blueprints For Travel, LLC. Retrieved May 2, 2010. Texas Escapes - Blueprints For Travel, LLC. ^ "Parker, Elder Daniel". Find A Grave. Retrieved May 2, 2010. ^ Bob Bowman. "The Parker Family". Texas Escapes - Blueprints For Travel, LLC. Retrieved May 2, 2010. Texas Escapes - Blueprints For Travel, LLC. ^ "Faulkenberry, David". Find A Grave. Retrieved May 2, 2010. ^ "Palestine, Texas". Texas Escapes - Blueprints For Travel, LLC. Retrieved May 2, 2010. Texas Escapes - Blueprints For Travel, LLC. ^ Bradberry Jr, Forrest E. "Anderson County in the Civil War". Palestine Herald Press. Retrieved May 2, 2010. ^ Tim Madigan (January 16, 2016). "Texas marks racial slaughter more than a century later". Washington Post. Retrieved January 17, 2016. ^ Terriere, Robert (1976). Braunstein, Jules (ed.). Geology of Fairway Field, East Texas, in North American Oil and Gas Fields. Tulsa: The American Association of Petroleum Geologists. pp. 157–176. ISBN 0891813004. ^ "Gus Engeling Wildlife Management Area". Texas Parks and Wildlife Department. Archived from the original on April 3, 2010. Retrieved May 2, 2010. ^ "2010 Census Gazetteer Files". US Census B. August 22, 2012. Retrieved April 18, 2015. ^ "Population and Housing Unit Estimates". Retrieved February 12, 2019. ^ "US Decennial Census". US Census Bureau. Archived from the original on May 12, 2015. Retrieved April 18, 2015. ^ a b c d e f g "www.co.anderson.tx.us/default.aspx?Anderson_County/Home". www.co.anderson.tx.us. Retrieved January 23, 2018. ^ a b c d e f g "Counties: Anderson - Texas State Directory Online". www.txdirectory.com. Retrieved January 23, 2018. ^ Powledge Unit Archived July 25, 2010, at the Wayback Machine. Texas Department of Criminal Justice. Retrieved May 13, 2010. ^ Beto Unit Archived July 25, 2010, at the Wayback Machine. Texas Department of Criminal Justice. Retrieved June 5, 2010. ^ Leip, David. "Atlas of US Presidential Elections". uselectionatlas.org. Retrieved July 19, 2018.